What? !… No, don’t be alarmed; cool-old-term has just changed name in cool-retro-term. But why?… Well, cool-old-term was a sort of boilerplate name I chose at the beginning of the project and it stuck when the project became more popular. cool-retro-term keeps familiarity and has a very cool acronym so we can talk nerdy: “Have you tried CRT. It’s really great!”. Why didn’t you do that before?… Because I was planning to change the way the program is built and I didn’t want to break the packages twice. Now all packages can be updated only once and I promise I won’t break them again anytime soon. What else did you change?… Well in the last month many things have. New features such as mouse support, color support, improved/fixed key combinations have landed in master together with many bugfixes. 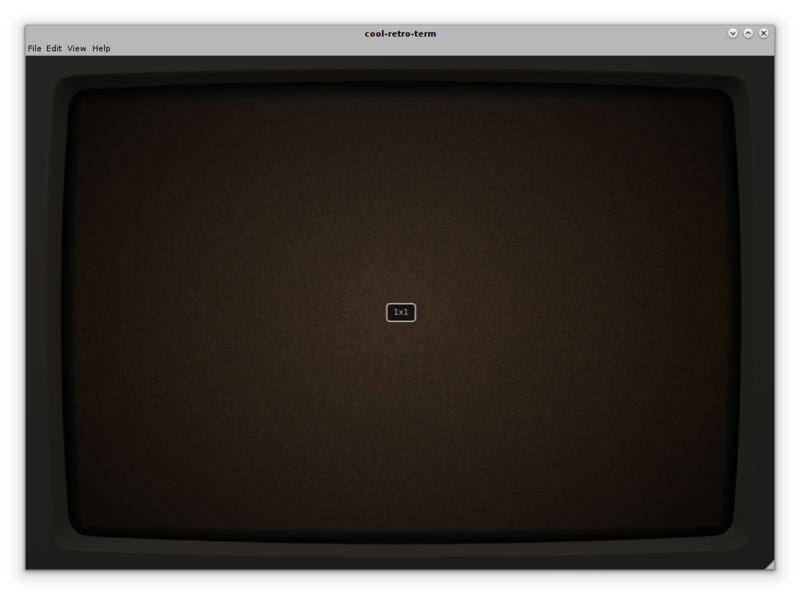 Moreover we are working on a OSX port which will see major improvements in the short future. Why are you interviewing yourself?… I actually don’t know, but I’m going to take advantage of this question to thank all the people who contributed to the project. Some of you helped with the code, some with the packaging/docs, some donated money and some just spread the world. You have all been amazing! Thank you very much! Brace yourself… cool-old-term is coming! I am a little frustrating, I install it on my Arch Linux x86-64 from AUR. Everything is frozen, even the menus. I have to kill the process to exit. Thank you!… What do you mean with “hide / unhide keybindings”? If you are talking about the menubar, that would be easy, it’s just a matter of finding the right keybinding. With respect to tabs, this was already discussed in the past, I’m quite against them but I also see that they are one of the most requested features so we’ll see. Anyway this will surely not happen soon since at the moment I’m trying to fix the issues to get a stable release. How to start in fullscreen mode? Well, that’s a good idea. Currently there is no way, but what about adding a –fullscreen command line argument? hello there. i m sorry but where do I put the -fullscreen argument ? –fullscreen Exactly what is needed! Another suggestions is to add the locked screen effect when quit the terminal like android phone. I tried in the past and it looked awful 😀 … It’s still definitely in my TODO list. It starts in the directory from which it is called, that’s the expected behavior. There is a flag though (–workdir) that let you change it. How exactly I must use the flag? 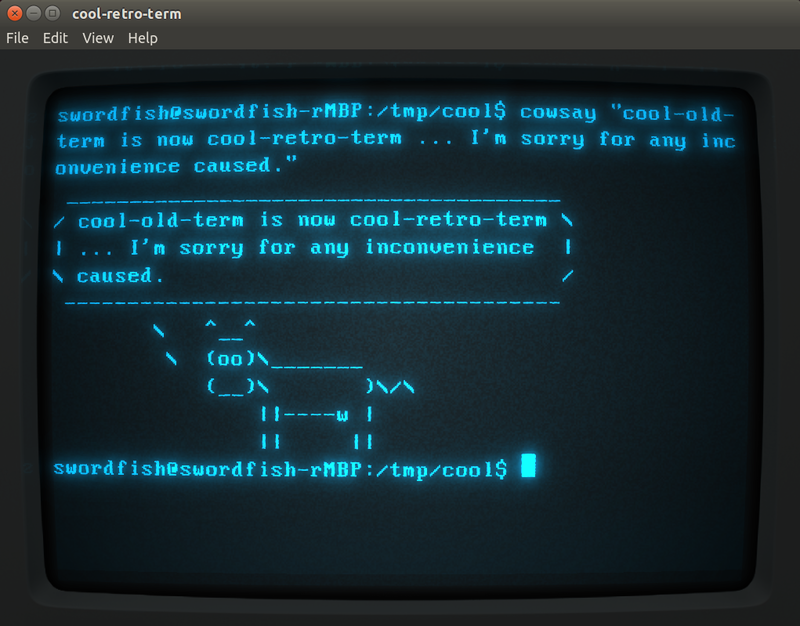 ./cool-retro-term -workdir:~ ? Or in the .desktop? Hai there is no scroll bar and I am using Ubuntu 14.04, please fix this in next release I almost left using the default terminal, this is so cool! I’m glad you are enjoying it. An overlay scrollbar is something that I would really love. Right now I’m working heavily on the plugin (basically rewriting it) just to expose those kind of things and fix issues. Just wanted to say thanks taking my suggestion, made me feel all warm and fuzzy inside. So you are the mind behind this! 😀 … Many people suggested me that name, but I didn’t know where it came from. Thank you Mcorther! HI – thanks for the great terminal. I use it as a daily burner, however there are a couple of things that i am having issues with. Cut/Paste – I can mouse up with to some past commands, however the terminal jumps back to prompt when I click to select some text. Is it possible to select/copy from buffer? Logging- would it be possible to log console output to a text file? I’ll try to answer your points in order. Which version are you running? There was an issue selecting lines in the previous history, but that was fixed in the last revisions ten days ago. Please let me know if you experience the issue also in the latest master. What do you mean by copy from buffer? If you are talking about copy selection, just select some text on the terminal and press the mouse wheel to paste it. If you want to record all the session, so all your commands and responses there should be a program called script that does that. I really hope I went through all your questions, and thank you for the beers! Hi – The version listed in About is 0.9 . My install/build date was November 12, so that is outside of the 10 day mark. On my migrating from windows: I just wanted to say that this is a killer app, and is *part* of the reason I’m running Linux on my laptop now (all I used in windows was chrome, putty and RDP), but CRT was *the* reason I picked kde over gnome. Love this terminal – wish you loads of success. Wow, I’m really glad to heard that you like CRT this much! The fact that CRT is based on Qt doesn’t force you to use it only in Qt DE (actually Qt applications looks really good under gnome). Wrt logging, that would be a nice feature, but I think it’s a little outside the scope of this terminal emulation. The solution I proposed with script anyway should to the trick (http://askubuntu.com/questions/161935/how-do-i-log-all-input-and-output-in-a-terminal-session). Additional Feedback – One of my profiles causes the CRT to close. Is there a log file I can send you? Then make the application crash in a spectacular way. Hey – sorry it took so long, but the above resulted in an empty log file. We so need a Windoze port! So in love with the look of this… the ONLY thing I wish it had was the ability for multiple tabs. Is this on the horizon at some point?